Last Friday I participated in a call-in show on CTV Newsnet regarding the role of government in obesity prevention policy. A well-known Toronto paediatrician – Dr. Mickey Lerner, joined me. While I knew from my pre-interview discussions with CTV that Dr. Lerner and I didn’t see eye to eye on everything and that Dr. Lerner felt willpower and education are the keys to success, I was beyond dismayed when Dr. Lerner, on National television, stated that he thought that rather than tax sugar-sweetened beverages, that we should tax obesity. 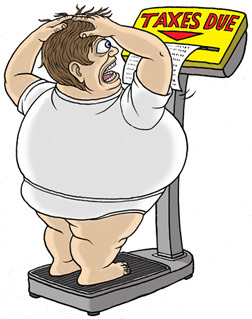 He stated that he thought it would be wiser for Canadians to be asked to enter their BMIs on their tax forms and be levied taxes proportional to their weights than to unfairly penalize those who aren't overweight with soda taxes. Putting aside the fact that the consumption of sugar-sweetened beverages is no healthier for skinny folks than fat ones, as I’ve blogged about before, even if obesity were purely an individual’s problem, even if the research that suggests that weight and health are not in fact mutually inclusive or exclusive were wrong, even if over the course of the past 50 years we’ve truly suffered an epidemic loss of willpower and that we’re lazily and gluttonously choosing not to try, even then medicine is not about blame. And that’s what made my blood boil. So just for kicks I decided to spend a few minutes of my time today compiling a list of other folks we could target with higher taxes. Folks who don’t complete their course of antibiotics and require further MD or hospital visits. Folks who stop their antidepressants too soon and crash, go on disability and require regular MD followups. People who never bother going to MDs who later require any number of procedures or hospitalizations as a consequence of waiting too long to address a treatable condition (like the non-compliant diabetic who receives a triple bypass and 6 years of dialysis). Heck, if we decide that taxation should be determined on the basis of how well we look after our medical conditions and live our lives we could kiss our deficit goodbye in a hurry because I'd bet there's barely a person alive who consistently follows through with completely clean and healthy living. Taxing products that are themselves unhealthy to consume is no doubt the responsibility of any government. But taxing people with excess weight because in theory they might have gained their weight eating those products? That's just hateful or misinformed stereotyping of a condition that has dozens if not hundreds of causes and it ignores the fact that scales are absolutely terrible tools to measure health. I know skinny folks who live incredibly self-destructive and unhealthy lives that cost the tax payers huge sums of money, and folks who are fat who live healtheir lives than me and cost the system nothing. During the call-in show there were many callers who agreed with Dr. Lerner, and while they might not be expected to know any better, the same can’t be said about the good doctor.